A state-owned corporation proposed to build a new water supply dam to augment existing sources. We were asked to help the company to examine the construction cost estimate for the new dam, and to identify and quantify the sources of uncertainty in the estimate. We conducted a workshop and prepared a quantitative risk model. 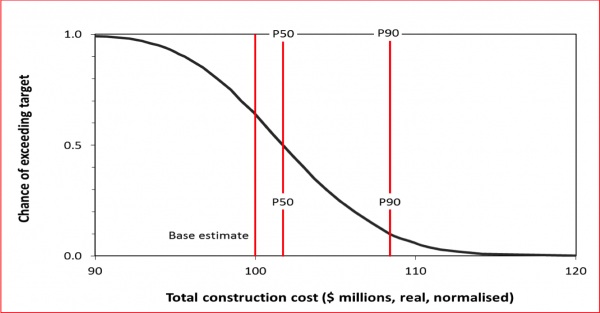 This produced a distribution curve of the range of realistically likely construction cost outcomes, to assist in determining the confidence that could be placed in any specific cost target, budget or contingency. A state-owned corporation provided water and wastewater services to a group of local authorities. The corporation proposed to build a new water supply dam, to augment existing sources that were nearing capacity as the regional population increased and to provide additional system capacity for drought management. The dam site was chosen from a range of supply options that had been identified and investigated progressively over many years. At the selected site, the best dam configuration involved a reservoir that would inundate over 2,000ha of agricultural land. The project included a detailed environmental assessment, necessary approvals from planning and other agencies, purchase of land and the design and construction of numerous physical components (Table 1). Most items that make up a project’s aggregate costs are uncertain, whether because the complexity and scale of the work has not been specified exactly in advance or because only quoted rates have been obtained from the market and these might change when firm orders are placed. Some projects are also subject to uncertain events with the potential to add lump sums to the costs. These might be unlikely events that cannot be addressed by contract terms, hedging or insurance. For example, one potential event that was taken into account in this analysis was that the planning authority might direct the company to make a major contribution to the upgrade of the local road network in recognition of the fact that the construction traffic for the dam would use these roads. 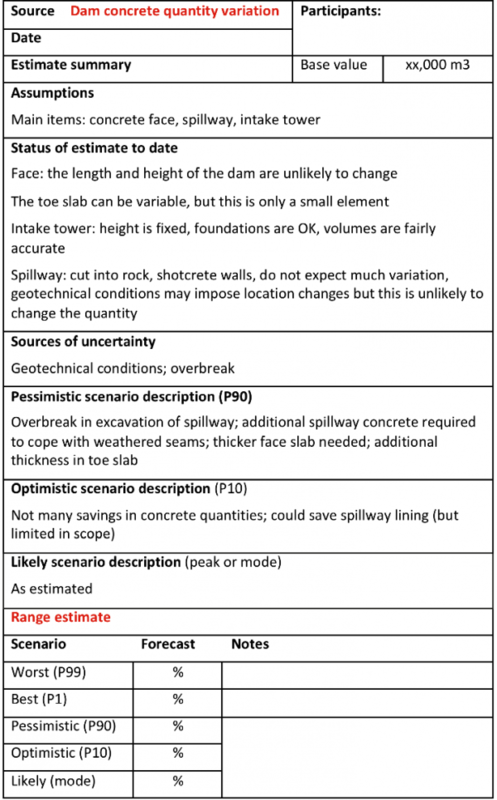 To assess the uncertainties in the construction cost estimate, the total cost was disaggregated into parts, the uncertainty in each part was described and then the components were recombined to form a view of overall uncertainty. The uncertainties and associated probabilities were modelled using @Risk in Excel. Detailed cost estimates had been developed for different parts of the project. These were simplified for the purpose of the analysis to allow easier identification of the primary drivers of variability in the estimate. The drivers were related to quantity variations, usually associated with the nature and location of the work being performed, or rate variations, usually associated with the kinds of resources used on each part of the work and generally common across all similar work items. Identifying and examining the common drivers generated a clear overall view of uncertainty in the estimate. Preconstruction and land purchase costs were excluded from the uncertainty analysis on the basis that these activities were well advanced and there was a high level of confidence they would be delivered on budget. Table 2 summarises the structure of the estimate. We conducted a workshop to examine uncertainties in the cost estimate. It involved participants from the company and its professional advisors, with a sound collective understanding of all the components listed in Table 1 as well as the commercial aspects of the project. Potential variation ranges were assessed in the workshop as three-point estimates, using structured data tables like Table 3. For each range, worst (P99) and best (P1) values were estimated first to ‘condition’ the process and counter both over-confidence bias and anchoring and adjustment bias. Then pessimistic (P90), optimistic (P10) and likely views of the variation from the base estimate were used to define a triangular distribution (Figure 1). A realistic cash flow profile was used to ‘spread’ the estimate over the project construction period. No variation in construction start date was assessed. Schedule uncertainty was discussed in the workshop. A schedule variation distribution was used to adjust the entire cash flow profile, on the initial basis that any variation in schedule would apply uniformly across all parts of the work. For example, a 10% increase in schedule duration would cause the first year’s work to extend by 10%, the second year’s work would start a tenth of a year later and extend a further 10%, so the third year’s work would start 0.2 of a year late and so on. The analysis considered real (today’s dollars) and nominal (escalated) cash flows with a designated escalation rate. The escalation rate was not varied in the initial analysis. Rate-based preliminaries for the roads and services contract. In each case, the indirect costs or preliminaries items were adjusted in proportion to the schedule duration variation. This was a conservative approach to the additional costs that might be incurred in the case of project schedule extension. These adjustments flowed through to construction management fees and head office costs. Risks associated with exchange rate fluctuations were not specifically considered due to the negligible proportion of imported goods required for the construction. Separate assessment of variations in fuel and steel prices were considered to incorporate the more relevant effects of exchange rate fluctuations. Uncertainty in the level of competition in the domestic construction market was addressed by considering variation of indirect costs and profit margins. While flooding could have a major effect, the rates (including insurances) and the schedule uncertainty took this risk into account. 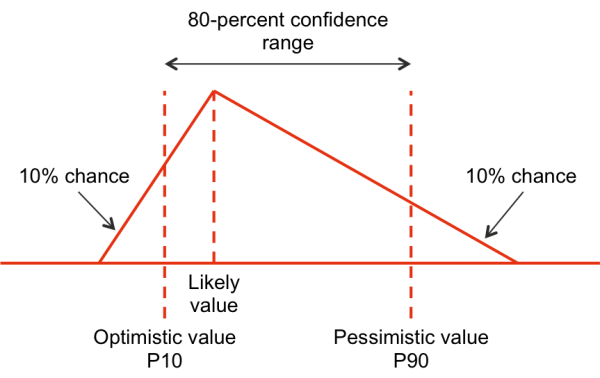 Figure 3 shows the main drivers of uncertainty in the construction cost. Uncertainty in the unit price of steel was associated with other major projects in the region, as well as international market influences on raw steel prices. Political factors underlay the additional roads costs, with local authorities anticipated to take advantage of their temporary leverage to require the project to upgrade local roads. While some aspects of duration uncertainty could be attributed to the physical construction, and particularly geotechnical conditions, there were also social factors associated with the relocation of graves and the future use of the historic house that were expected to require additional community consultation. The extent of reafforestation had not been examined in detail at the time we undertook this analysis, and there was uncertainty about whether additional forest offsets would be required by the environmental approval agency. The project discussed here was relatively straightforward, the components were well understood and there were few major risks associated with the construction itself. Apart from the price of steel, the main uncertainties were associated with political, social and environmental matters. The outcomes from the model were used in the business case for the dam, and the nominal cash flows contributed to the analysis of financing options.